I’d like to begin this article by saying welcome back to another glorious semester here at University of Illinois at Chicago; as usual, I ushered in the new year by being incredibly lazy, and I’m sure you had the same response. Whatever. Let’s talk about MGMT who is releasing their 4th studio album on February 9, 2018. So, the 2017 fall semester is coming to an end. Many of us call Chicago home, while a good group of UIC students think that they are from Chicago but are really from the suburbs (such as myself). After spending about four months at UIC, it is definitely nice to take a break and come home for the holidays to spend time with family and friends. Winter break officially begins on December 16th, 2017 and ends on January 16th, 2018. You might have some apprehension regarding not knowing what to do during break. Because humans really like to read lists, I have compiled a few things that will hold you over until the spring semester. 1. Get a job, you lazy bum. I recommend the seasonal positions for Mobile Sales Consultants at Best Buy, Cart Attendants at Target, or even working for the Pavilion at UIC. Maybe even sign up to be a lifeguard at your local outdoor waterpark. 2. Go snowboarding and SHRED THE GNAR!!! I made it to my bed (or rack, as it was now called) the night of the Moment of Truth. My division was sleep-deprived for 49 long hours. I’m pretty sure I saw the utensils at the galley swing-dancing in front of me; that’s how tired and cracked I was. In the 49 hours I had been at Great Lakes Recruit Training Command, my division got off those coach buses in the middle of the night, we spent hours getting our gear issued, getting our hair buzzed off, and going through hours of paperwork. On top of that, we ate 5 times at the galley, we spent time cleaning the head, (bathroom) we spent time stenciling our gear, and we received initial medical checkups. It was due time for sleep. The recruit division commanders were giving us 8 full hours of sleep, and our new temporary home was at the USS Red Rover. (It’s not actually a ship. It’s just a building named after one). Lying face up in my rack, I thought about my last day, right before the Navy. I wanted to cry for her to see, but I didn’t as well. It was strange. It was only that evening we were watching Silver Linings Playbook. We cuddled and hugged each other until it was time to leave. We didn’t watch Ant Man with her parents that night, either. It was only that afternoon we were sitting on the balcony of her house, reading some book about palm reading. I didn’t agree with her choices of what I was in a hand. It was only that morning we went out for breakfast, and we had one of our last meals together. At least the last one I spent taking her out. We switched cars to her driving after breakfast. I felt pretty happy in her arms. Getting denied head privileges by the Filipino Chief was my first taste of what was to come in the next few months. I was expecting some Full Metal Jacket type things, and I was getting a similar result. The next couple of hours involved the new recruits going through gear issue. Everything that every recruit brings is put in a 1×2 box: this includes your phone, your wallet, any civilian clothes, and just anything that a recruit brings. Everything that made you who you are, as an individual, is taken and shipped back home. After exchanging personal items, I went with the rest of the recruits to get issued our basic uniforms and toiletry items. I had just bought a new 2016 Jeep Wrangler. My friend Dave, my dog and I were out hunting in Northwestern Wisconsin, around the University of Wisconsin – La Crosse area. We were pretty far into the woodlands as well. Deer season comes around at the end of the month of November, so by this time, the ground was covered with snow, and the air was frigid. Nearby our hunting grounds was a large frozen lake. We toted our shotguns still loaded, actions open, however. Driving my new Jeep out onto the ice, the three of us wanted to take a break from sitting in the deer blind (camouflaged tent in which you wait for deer to come around) and spend some time ice fishing. Normally, you would use an auger or an drill bit to drill through the ice. After creating a conservative hole, you can then begin to fish. However, Dave had another idea to create a spot where we could ice fish. The Petty Officer rounds us up, not unlike cattle. Wide-eyed, matching the looks of the individuals around me, we all sternly follow this strangely dressed man down by the departure gates of O’Hare airport. I almost forgot my bag in the USO office; it’s a bit redundant to say, but that would have sucked big time. It was strange. O’Hare was an airport that I was so comfortable with. From the departure gates, I could see all of the terminals and check-in booths and rent-a-car stations that I remembered from when I was younger and I would be going on family vacations to wherever around the country or world. I felt pretty old now, and I just turned 18. We were instructed to sit down on the floor of the terminal and to “shut the f*ck up”. I say that in quotes as I do not use sentence enhancers lightly. The guys in charge of us really did have mouths like sailors, and that scared a few of us. I thought it was hilarious. My fellow shipmates and I departed from the MEPS, or military entrance processing station feeling quite valiant, dare I say honorable. The only thing we truly did that day was sign some paperwork, then it was off to the buses for basic training. Let me rephrase that: the only thing we did that day was sign paperwork. As in, from 0600 to 1500 we did nothing but sign paperwork. Who knew that the MEPS was so similar to the DMV. Despite all the metaphorical papercuts, our family and friends were waiting outside the buses, cheering us on. I felt a sense of pride that I was becoming something more than myself, although that pride was not even close to being earned yet. My mom was recording the entire walk from the building to the bus on her iPad. Filipinos like to record everything. And then I dropped my paperwork all over the pavement. I looked like a complete fool in front of everyone’s families, but I quickly scooped it up, and acted as if nothing happened. (2130) SR Cuartero has assumed the watch, GRLKS. Division disseminating letters for mail call. We are moored port side, and currently receiving miscellaneous services from the pier. No new government defacement in sight. “CUARTERO!” My Recruit Division Commander screamed out. My eyes turned into silver dollars as I ran as fast as I could to the center of the room. I took the letter from Senior Chief’s hand, returning to my spot by my bunk. My fellow shipmates were called to the center of the compartment just the same as I. The looks on their faces mimicked my own; wide eyed, and their pupils were silver dollars. Senior Chief gave a perimeter sweep with his eyes, commanding the 73 recruits to do jumping jacks when he said jump, perform pushups when he said push, and shoot when he said shoot. And he didn’t even say anything yet. 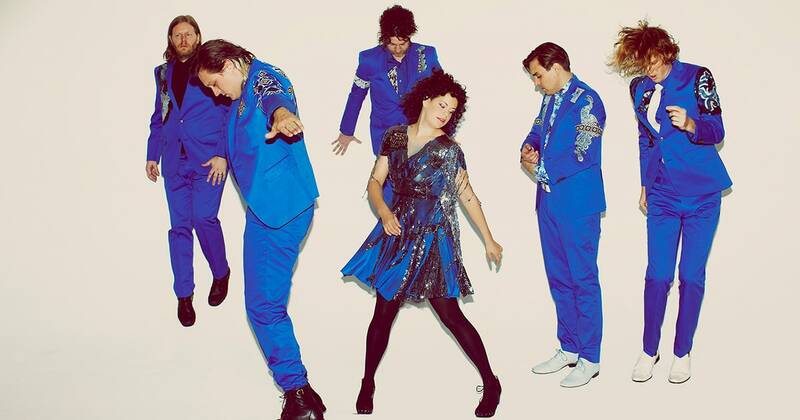 Arcade Fire was last spotted at this year’s Lollapalooza. They return to town on October 30th, but this time, they have come with only one other musical compatriot (The Breeders). I don’t have much to say about the upcoming show; Arcade Fire is fantastic live, and I urge anyone who is either fans of Arcade Fire or fans of electronic indie rock to see the show next Monday. You guys can grab tickets here. Anyway, in preparation for the upcoming show, I wanted to list the Arcade Fire albums, from my personal opinion on worst to best. I hate to jump on the bandwagon to place the most recent album last for any artist or band, but I think that in this case, Arcade Fire had somewhat of a hiccup with “Everything Now”. I still think that it is a solid album, but among the rest of Arcade Fire’s discography, it falls short. This album sounds the most synthetic and electronic in Arcade Fire’s productions. The most notable negative of the album is the fluff. The concept of infinity in the album seems to be lost due to a lot of weaker tracks that take away from the cynical message of the entire album. I noticed that the album seems to split itself up with the tracks Infinite Content (1) and Infinite Content (2). These tracks are much weaker than the rest, and the position of the songs in the middle of the album breaks up the smooth continuity that I think should have been present in this album. I do like the message of the album, that being that the world is constantly choking on its own abundance of resources, and that pain will continue infinitely with the cultures we force ourselves to have. My personal favorite track on the album is Electric Blue. It stands out among the rest, and Regine Chassagne’s vocals are very much welcomed. “Neon Bible” introduces somewhat of a similar theme to Everything Now, but on a much grander scale. Everything Now was more about American cynicism and pain, while Neon Bible is about much more: dangers of religion, the government, and personal dread. Basically all of Arcade Fire’s albums talk about pain, but Neon Bible tackles this issue in the biggest way. There are a lot of Bruce Springsteen and American themes in how this album presents itself. The album is lower on my list due to my personal dislike for the flow of the album; almost all of the tracks stand out, but they do not work well with each other. Each track seems to be performing their own thing, and with concept albums like this, I think that the spread of themes was a bit too wide with Neon Bible. My favorite track on this album owns its album’s namesake: Neon Bible. Arcade Fire’s debut album “Funeral” already starts off with a somber tone in its title. The themes in this album may seem obvious, but I want to say that this album deals with death the least. I think that this album talks more about the celebration of someone’s life rather than their death. This album is the most conventionally rock, but it is very satisfying to listen to each and every track. The album is a much more digestible piece of music than “Reflektor”, clocking in at 48 minutes. One theme that it covers very surprisingly are hometowns; Funeral has a backstory of youth living in small towns around the world, from America to Russia to France. I believe that Funeral has the deepest story in all of Arcade Fire’s albums. I would say that this is Arcade Fire’s best album, but I still personally enjoy the following album more. My favorite track in this album is “Neighborhood #2 (Laika)”. I can listen to this album any day of the week. “The Suburbs” draws so many parallels to my own coming of age and it is such a fantastic album to listen to. The deaths of childhood are prevalent in the themes of The Suburbs. It talks about the evolution of technology, the blind happiness of childhood, and the irreversible fate and cynicism of adulthood. The Suburbs is the most conceptual album out of all of Arcade Fire’s, and while “Funeral” had the most in depth, The Suburbs follows how a child would grow up in an average American suburb, along with the trials and tribulations that accompany the coming of age. It is a pretty long album, clocking in at 62 minutes, but I love every second of it. It is very much conventional rock in a musical sense, and it I would say that this album is the most relatable out of all of them. Even if you didn’t grow up in a suburb, everyone eventually grows up or dies before they do. My favorite track in this album is “Suburban War”. That’s me. The one in the middle of my cub scout den, pretending to fire an invisible rifle. Den meetings at Mr. Martin’s house. This is like a squad meeting. Yes, we made miniature catapults that shot marshmallows, created a AA battery light, and we even went to the town park for good conduct one day. I should have gotten two scoops of ice cream instead of one. Pack meetings at the grade school I went to. This is like the battalion meeting, where all the squads meet up. We had pinewood derby races, threw pies in the faces of our adult leaders, and planned for campouts. Campouts, which was not really camping. Most of the time, we went to the summer camp at Camp Freeland Leslie, (This was a camp up in Wisconsin) Wilderness Water Park, (In the Wisconsin Dells) or day events like volunteering for the food pantry. This was all good fun.